(Nanowerk News) An international research team, co-led by a physicist at the University of California, Riverside, has discovered a new mechanism for ultra-efficient charge and energy flow in graphene, opening up opportunities for developing new types of light-harvesting devices. The researchers fabricated pristine graphene -- graphene with no impurities -- into different geometric shapes, connecting narrow ribbons and crosses to wide open rectangular regions. They found that when light illuminated constricted areas, such as the region where a narrow ribbon connected two wide regions, they detected a large light-induced current, or photocurrent. The finding that pristine graphene can very efficiently convert light into electricity could lead to the development of efficient and ultrafast photodetectors -- and potentially more efficient solar panels. Graphene, a 1-atom thick sheet of carbon atoms arranged in a hexagonal lattice, has many desirable material properties, such as high current-carrying capacity and thermal conductivity. In principle, graphene can absorb light at any frequency, making it ideal material for infrared and other types of photodetection, with wide applications in bio-sensing, imaging, and night vision. In most solar energy harvesting devices, a photocurrent arises only in the presence of a junction between two dissimilar materials, such as "p-n" junctions, the boundary between two types of semiconductor materials. The electrical current is generated in the junction region and moves through the distinct regions of the two materials. "But in graphene, everything changes," said Nathaniel Gabor, an associate professor of physics at UCR, who co-led the research project. "We found that photocurrents may arise in pristine graphene under a special condition in which the entire sheet of graphene is completely free of excess electronic charge. Generating the photocurrent requires no special junctions and can instead be controlled, surprisingly, by simply cutting and shaping the graphene sheet into unusual configurations, from ladder-like linear arrays of contacts, to narrowly constricted rectangles, to tapered and terraced edges." 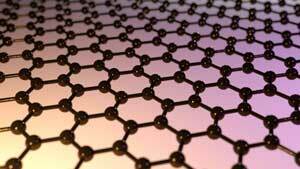 Pristine graphene is completely charge neutral, meaning there is no excess electronic charge in the material. When wired into a device, however, an electronic charge can be introduced by applying a voltage to a nearby metal. This voltage can induce positive charge, negative charge, or perfectly balance negative and positive charges so the graphene sheet is perfectly charge neutral. "The light-harvesting device we fabricated is only as thick as a single atom," Gabor said. "We could use it to engineer devices that are semi-transparent. These could be embedded in unusual environments, such as windows, or they could be combined with other more conventional light-harvesting devices to harvest excess energy that is usually not absorbed. Depending on how the edges are cut to shape, the device can give extraordinarily different signals." The research team reports this first observation of an entirely new physical mechanism -- a photocurrent generated in charge-neutral graphene with no need for p-n junctions -- in Nature Nanotechnology ("Giant intrinsic photoresponse in pristine graphene"). Previous work by the Gabor lab showed a photocurrent in graphene results from highly excited "hot" charge carriers. When light hits graphene, high-energy electrons relax to form a population of many relatively cooler electrons, Gabor explained, which are subsequently collected as current. Even though graphene is not a semiconductor, this light-induced hot electron population can be used to generate very large currents. "All of this behavior is due to graphene's unique electronic structure," he said. "In this 'wonder material,' light energy is efficiently converted into electronic energy, which can subsequently be transported within the material over remarkably long distances." He explained that, about a decade ago, pristine graphene was predicted to exhibit very unusual electronic behavior: electrons should behave like a liquid, allowing energy to be transferred through the electronic medium rather than by moving charges around physically. "But despite this prediction, no photocurrent measurements had been done on pristine graphene devices -- until now," he said. The new work on pristine graphene shows electronic energy travels great distances in the absence of excess electronic charge. The research team has found evidence that the new mechanism results in a greatly enhanced photoresponse in the infrared regime with an ultrafast operation speed. "We plan to further study this effect in a broad range of infrared and other frequencies, and measure its response speed," said first author Qiong Ma, a postdoctoral associate in physics at the Massachusetts Institute of Technology, or MIT.